Home / iPad / MathTerms now live! 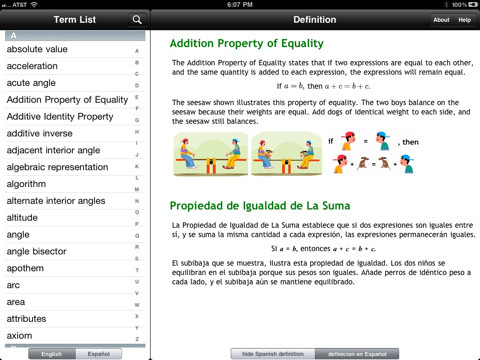 The iPad appication, “MathTerms” is now live and available on iTunes. For more information and support, you can use the top navigation menu to go to Apps -> MathTerms. 5 Responses to MathTerms now live! Unfortunately, I do not, nor does our school, have access to an IPad to be able to take advantage of such a wonderful application like “Math Terms.” Our Spanish math tutor does have it on her personal IPad, but I would like to know if there is any way to buy the product in order to be able to use it on my computer in my classroom. I am a high school ESL teacher and know that this particular application would be tremendously advantageous for my students who are in the process of learning English. Thanks for your help! Keep up the great work! We need you! I use the Math terms app on my iPad, but cannot find it on iPhone. Is it available for iPhone? Any chance that your dictionary has a french translation on the way? Sorry Stephanie, while I’ve tried to learn French in High School and College, I am not conversant — and it would be a *lot* of work for anyone to do.